Often on a tea table at Tatars it is possible to meet an ancient national dish - yuka. Yuka in tatar - a flat cake. Flat cakes to tea hot move, for this purpose a pile of flat cakes put on the big plate and cover a linen towel that have not cooled down. 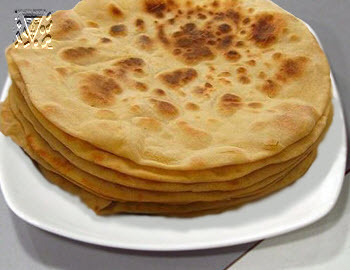 To prepare unleavened dough, to cut on slices on 100 g and to unroll round flat cakes in the thickness 1,5 — 2 mm, size more than a tea saucer which bake without fat or on hardly to the greased frying pan. Ready flat cakes can be sugared, it is possible to grease with jam. Prepare rich fresh dough. Slices of the test in weight approximately in 100 g unroll in 1,5 mm in the thickness and bake on a frying pan without fat. Further arrive the same as in the previous recipe.